The extramarital affair between actress Li Xiaolu (李小璐) and rapper PG One shocked the Chinese entertainment industry. In December of last year, intimate photos of Li Xiaolu and PG One were shared online, prompting her husband, actor Jia Nailiang (贾乃亮) to release a statement pleading for privacy. Li Xiaolu’s image dropped to a new low. Though it’s been rumored that the couple have already separated and are filing for divorce, Li Xiaolu’s recent social media are bringing that speculation to a different direction. About a week ago, the Beauty World <美人天下> actress shared three images from the Sailor Moon anime on her Instagram that seemed to be hinting at her current situation and relationship with Jia Nailiang. Li Xiaolu did not share what the images meant, but netizens have been quick to speculate the meaning behind the images. 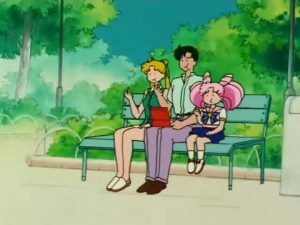 The first image Li Xiaolu shared featured a screenshot of Usagi (Sailor Moon), Mamoru (Tuxedo Mask), and Chibiusa sitting together on a bench, eating a snack. The second image featured Sailor Moon holding onto Chibiusa for dear life as a villain is advancing towards them. 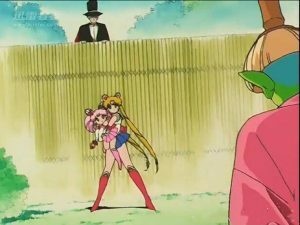 Tuxedo Mask, who is behind a fence, is watching them. 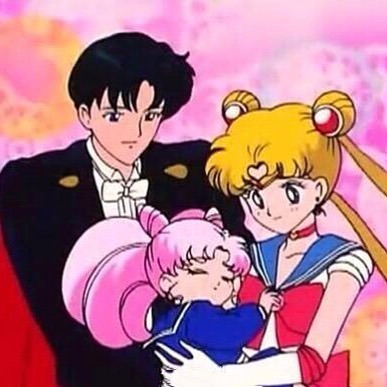 The last image is of Sailor Moon holding Chibiusa in her arms with Tuxedo Mask next to them. In the Sailor Moon anime, Usagi’s true identity is Princess Serenity of the Moon Kingdom, and Mamoru is her husband, Prince Endymion. 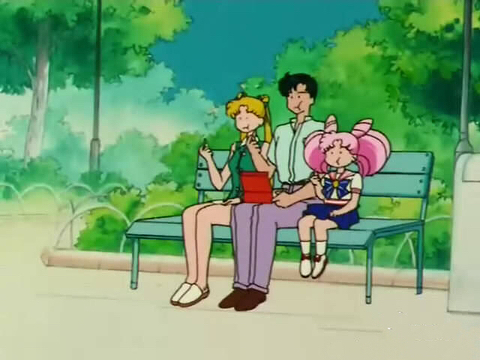 Chibiusa is their daughter. It appears that Li Xiaolu, who has a daughter, Jelena, with Jia Nailiang, is comparing her own family to this Sailor Moon trio. Netizens were quick to analyze the photos series, which seem to be reflecting Li Xiaolu’s current stiatuion. The first photo—Sailor Moon’s family of three—appears to be a reflection of Li Xiaolu and her family of three before the cheating scandal. One netizen believed that the second photo represented Li Xiaolu and her daughter getting attacked by the media, with Jia Nailiang on his way to save them. Another netizen came to the conclusion that the second photo represented Jia Nailiang’s uselessness as he watched Li Xiaolu and her daughter getting hounded by negative reports. As for the third photo, the family portrait, one netizen believed that it represented Li Xiaolu’s desire of wanting to hold the family together. As it’s been rumored that Li Xiaolu did not spend the Lunar New Year’s with her daughter, this was Li Xiaolu’s way of saying that she missed her daughter. Another netizen analyzed that the photo could mean that Li Xiaolu has already reconciled with Jia Nailiang, and the scandal has become nothing more but the past. What do you make of these photos? Whatever happens to this marriage, I hope little Helena does not blame herself. Children tend to blame themselves when there is trouble with the parents’ relationship. No matter how we see this situation unfold, it is sad for everyone involved. Slightly off topic, looks like Vanessa Wu is really divorcing his wife this time. Divorces are so emotionally gutting after lifetime vows are so lovingly made. So very sad. I thought that Li Xiaolu is suing for defamation? Why put up such drawings?